Happy Bloggers Challenge Friday! Thanks to those who played along with last weeks Silhouettes Challenge! This weeks challenge is Elements of Time. 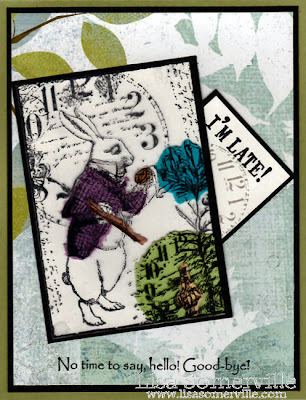 My card features images from the Artistic Outpost Wonderland Collage plate, using the Torn Under Transparency Technique from the Feb/March 2011 Technique Junkie Newsletter. If you'd like to play along with this weeks Bloggers Challenge, please link back to this post on your blog and mention you created your card for the Bloggers Challenge Elements of Time Challenge. Please add your link using the Link Tool below, your link should be a direct link to your Bloggers Challenge Post, use your name as the Title. Please do not link to cards that were created prior to the challenge date. Entries not linking properly, or backlinked will be removed. If you have the captcha enabled on your blog, please consider turning it off, as it makes it so much easier to leave comments. Great card, Lisa! Love the bright pops of color. How fun, Lisa! Love the pops of color on the image panel. Perfect choice for the challenge. I like the bg paper....it gives the layers such a different look, and I would have never thought to use it! Great card! Super colours, love the image and sentiment! Great colors on this. I was thinking of using this set too...might have to rethink since I'm behind this week. Lisa this is so beautifully designed. Loving your creative style. Lots of eye candy here. Wishing you a fab Friday. You used one of my favorite stamps. Love the torn under transparency technique with this image. Great card. Love it, Lisa - the transparency works so well with this image, making it really other-worldly - fab! Beautiful use of the MB papers with the rabbit from Alice! Love the hint of color under the transparency!